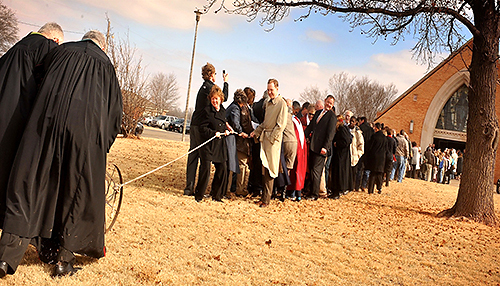 Worshippers pull together to break ground Jan. 23 for a building project. Chuck Nordean, left, and Dan Peil stand beside an antique plow. 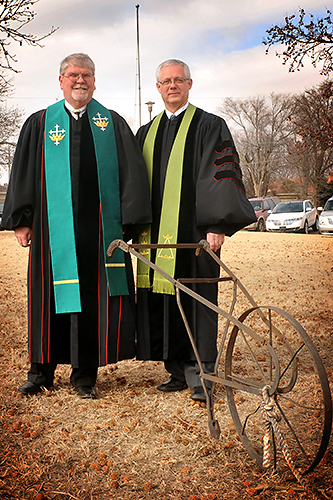 Worshippers at Elk City UMC lined up to plow ground Jan. 23 for an addition to the facility. Symbolic of the capital campaign theme, "Together With God We Can," they pulled together on a rope attached to an antique hand plow. The long rope stretched from the front lawn into the sanctuary so all could participate. The $4.3 million project will include a narthex, with a welcome center and space for fellowship and receptions. There will be a Life Center for fellowship dinners, New Day worship, the annual Bazaar, recreational activities for all ages, and district events. A new kitchen and courtyard are planned. Construction is expected to take 14 months. The Building Committee is led by Terry Pasby. Major funding is from an endowment by C. Kelly and a more recent estate gift by Bill and Carolyn Music. The congregation is raising an additional $1.35 million. The groundbreaking service was led by Clinton District Superintendent Chuck Nordean and Elk City’s pastoral staff of Dan Peil, Carlos Ramirez, and Wendi Neal.